Why Aren’t You Watching THE AMERICANS? Look, I know why you aren’t watching THE AMERICANS. It’s the same reason anyone who cares about TV has for ignoring whatever the critics have bequeathed of the moment “best prestige drama.” Time; as in, this series is actually just slow and boring, or that other, uniquely contemporary and privileged excuse, where there’s just too much good prestigious drama for me to watch and I can’t possibly watch it all. “I’ve got a lot on my plate,” we say. And we really do have a lot on there. I want to let you know that you can, right now, begin a healthier regimen for the shotgunning of pleasure into your eye and ear holes. As a kind of nicotine patch, I suggest THE AMERICANS. It is, as you may have heard, the best drama airing on television right now, and surely as worthy of premature canonization as any of the other golden age TV saints—but that’s not why you should watch it. I understand how something being “good,” or even “the best,” whatever that means, isn’t a convincing reason when we have so much other good and best on our plates (although this show is both the most good and the most best, and deep down you really do know what that means); nah, you should watch THE AMERICANS because the sound is often very quiet. What I mean is that let’s abandon, for a moment, some ideas about the show which make it the best: how its staging of the American family, with all its banal rituals, is full of drama; how it repurposes the generic conventions of the spy thriller in want of an American moment, with anything close to an answer found in multiplicity, the lives of Black Panthers, anti-apartheid Afrikaners, Nicaraguan sandinistas, Pakistani secret police, Vietnamese KGB agents, and the many hapless American citizens that cross the Jennings’ path; how, barring some regrettable and clumsily handled exposition in the pilot episode, it avoids gratuitous violence, instead gifting the long take to the before and after. Let’s forget about all that for a moment and talk about volume. One dirty secret of film is that sound is likely more important for our sense of immersion than images. By stitching together those successive frames of captured unreality into a singular, more real-ish unreality, images become present, tangible, and tactile. Sound truly suspends our disbelief. The clearest example of this is when sound goes even minutely wrong, the slightest loss of synchronicity taking our attention out of the story and to the hiccup. We’re very accepting of dissonance between images (jump cuts! ), but much less so when it comes to sound. We delight in the specificity of sounds, and tolerate ambiguity. The sound in THE AMERICANS is nothing if not specific and immersive. On one hand, this is just the kind of craftsmanship we expect from our filmed entertainment. But on the other, where characters must avoid drawing attention to themselves, speaking their native language, revealing their true feelings, sound utterly defines the show. I think this is especially true because it’s a period piece. We often think that to convey that specificity, we need, on top of recognizably dated dress and furnishings, dated music and arch dialogue peppered with references. But THE AMERICANS follows in the tradition of that other Capital-G-Great period drama, MAD MEN, choosing to temporalize its story, in the broad sense, through clothing and set-dressing certainly, but, for that other, magically evocative extreme close-up sense we crave, in deep, plangent washes of silence, as seen below. As for moments of not-silence: the show’s commitment to subtitles is one of its smartest creative choices. Russian is just a beautiful language to listen to, and seemingly meant to be whispered. Every scene in the Russian Rezidentura serves to highlight how isolated and exposed the Jenningses are in the field, unable to ever speak anything but English, while also showing their skill at deception. 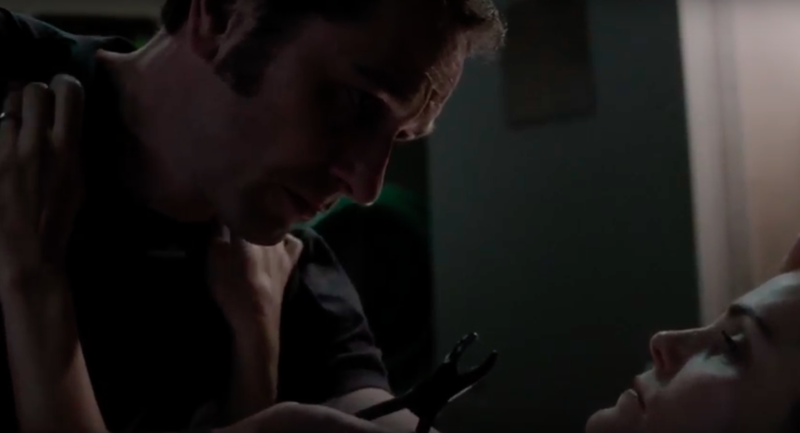 Watching THE AMERICANS, you are reminded of what a great privilege it is to say what you want to say in the way you want to say it, how speaking can be absolutely fraught with danger, mystery, and eroticism. This consideration of voice is thanks to the soundscapes of the show, pitched to a claustrophobic realism that’s only natural for the genre. For Crossfader’s TV favorites of 2016, I noted how in its 4th and best season it was more obvious than ever that THE AMERICANS was an exercise in “the explosivity of the whispered,” the key to all it all being the “pathological closeness” depicted by its actors. As in life, nothing conveys closeness quite like a well-acted silence. If you like excellent acting, swiss watch pacing, and an artful sense of place, I implore you to check out this show. If you can’t possibly imagine another helping of TV, I recommend it even more. Watching THE AMERICANS is frequently an exhilarating re-imagining of the recent past as spy thriller, but it’s just as often somber reflection of the present. Typically, this is because the show wants to enfold in a middle class suburban American experience the grander, harder-wrought themes of its genre. Marriage means always having to re-mediate a conversation on duty, honesty, and resistance against emotional numbness, even without the added complication of murder and treason. Parents are locked in a constant struggle against raising their children better than they were and outright lying to them, having no other lessons than their suffering, even without those lessons and that suffering being rooted in death and starvation. Two male middle-aged neighbors getting a beer after work is already full of subterfuge even before you know that one is a KGB agent and the other an FBI agent; you must be careful not to reveal weakness, in either circumstance. If you aren’t watching THE AMERICANS because you’re full up on TV, you’ve lived a charmed life, and more than likely, many of the most significant moments in it were hushed rather than bombastic: hurtful rumors, misplaced virginities, long stretches of loneliness, the TV murmuring with confusing tragedies foreign and domestic. THE AMERICANS re-imagines that quiet with the violence that is its due. I’ve avoided talking about this, mostly because it’d be misleading to think it directly factors into the content of the show, but viewing THE AMERICANS in the current political climate can be illuminating. I’m reminded of what writer Sam Kriss wrote about the insipid media response to a recent US military strike on Syria: “War is the only workable substitute for being able to turn off the TV.” The visceral human response to suffering is how do we make this stop?, but for the media-glutted American, who cannot fully comprehend horror outside what is caught in the boxes their thumbs caress or else hover over titillatingly in denial, we are always thinking, one way or another, how do we change this channel? So consider the title a question: Who are These Americans, the Jennings family, who can murder and lie and still go on like everything is normal? When they gather around the television set in one highlight of last season, marveling along with the rest of the country at David Copperfield as he disappears the Statue of Liberty, they are, if nothing else, patriots just like us. Jimmy Evans is a contributor here at Merry-Go-Round. He writes about rules, spaces, and feelings because sometimes they confuse him. In seventh grade he cut his hair to fit in and he’s been selling out ever since. Why Aren’t You Watching THE LEFTOVERS? Why Aren’t You Watching FARGO? More in Why Aren't You Watching? Why Aren’t You Watching HILDA? Why Aren’t You Watching DEADWOOD? View all Why Aren't You Watching?